The venerable Guerrieri Rizzardi estate is on a roll these days, cranking out some of the most interesting examples of Amarone, Valpolicella Ripasso, and Soave Classico you’ll find anywhere. Daniel Stewart paid us a visit last week and caught us up on all things Rizzardi-related. To listen, click here or pull us up on Spotify. JG: Hello and welcome back to another round of Grape, Unfined/Unfiltered; the podcast that peels back the pretty label to expose what’s really in the bottle. 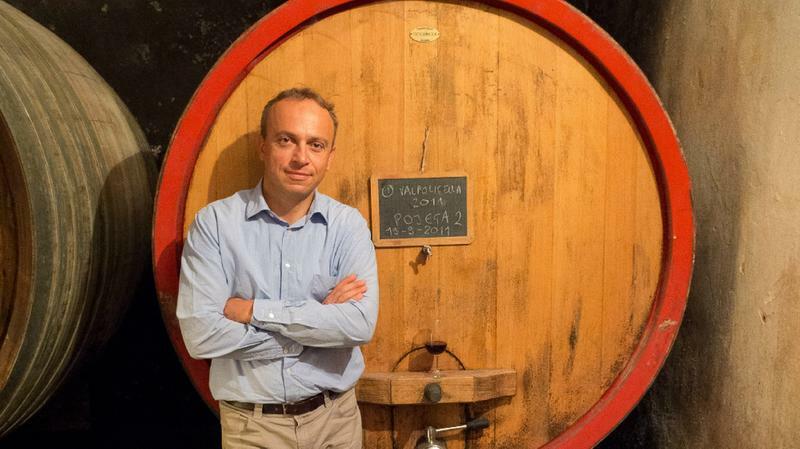 Today we’ll be talking Ripasso and Amarone with Daniel Stewart from Guerrieri-Rizzardi. Thanks for joining us in our beautiful tasting room here at the warehouse Daniel. DS: Thanks for having me. Glad to be here. JG: It’s a beautiful day. You’ve just missed the Snowmageddon we had a couple of weeks ago, so you got lucky. DS: Yeah. That’s what I heard. JG: So what, can you tell me for listeners who aren’t familiar with Guerrieri-Rizzardi? Are they a new winery? Are they modern? What’s the deal? DS: We’re a pretty established, old school producer, but not old school in the way we make wines, the wines are very classically styled, but they’re also very clean wines. JG: Yeah, I noticed that yesterday at our meeting with the staff, we were tasting the Soave and the regular Valpolicella and they were super clean, no funkiness, pretty pure fruit, you know, like the minerality really shone through. DS: Yeah. I mean that’s it. That’s very much the hand of their winemaker Giuseppe Rizzardi, who is a Rizzardi from the Rizzardi family. I mean the current owners are Giuseppe and his brother Augustino, and Giuseppe trained in Bordeaux as a winemaker and came back with very specific ideas. And one of the most important things that he wanted to do was to make sure that these wines were very clean expressions of the place. So you taste the Soave and you’re not interfered with by any kind of weird off aromas are any, any grape varieties that are too aromatic or two unusual. Really these are wines that taste of the place and in order to do that, they have to be very clean and pure. JG: I think he hit the nail on the head. So the name, Guerrieri-Rizzardi. I hear you referring to them as just Rizzardi. DS: Yeah, I mean a lot of people kind of struggle with the first name because it’s not that easy to pronounce. It’s a, it’s an Italian name where you roll the r’s in Guerrieri, but I mean there’s two names there simply because this is a combination of two families because a hundred years ago, the last Guerrieri married a Rizzardi and that combined the estates of Valpolicella and Bardolino. But, I mean the current owners, their sir name’s Rizzardi and this is a family that is established in the Vernonese area. And so for a lot of our importers in, in many of the countries that sell our wines, they refer to us as Rizzardi because it’s a little bit easier. DS: Do I not? I was trying very hard. No, I’m Irish originally. DS: Yeah. Yup. So I used to, I used to work for a very good importer in Ireland. We had a number of wine shops, quite a few in fact, 30 plus, and I was in the buying side of things and uh, the Rizzardi family, we knew each other over the years. They were one of our key imports. In fact, probably our most important Italian import, and that’s how I kind of ended up over there. JG: Wow. And so far so good? You’re liking it? You have your family and everything there and they like it? DS: Correct. Yeah, they’re pretty happy over there. JG: Well that sounds great. Maybe I’ll have to come and visit you. Let’s get to it. So we got this, uh, the Ripasso and the Amarone here. This is a 2015 Ripasso. I think you were mentioning that you are in 2016 now, so we’ll be seeing that pretty soon. Let’s try the wine. JG: Hmm. This is like, you know, it’s got a beautiful nose. I mean, yeah, it’s really more aromatic. It’s not really “aromatic”. It smells great. DS: This is the style of Ripasso that, it’s funny you’re talking about the nose. I mean it’s a style of Ripasso where the aroma is very much about bright, fragrant fruit. It’s not, you know, sometimes Ripasso can, can almost smell a bit jammy and kind of sweet. This is a very classic style. JG: Yeah, this is not sweet at all. DS: No, it’s not, I mean, it focuses very much on having good fruit purity and a word that we use quite a lot where we are is drinkability. You know, it’s not cloying, it’s not sweet. It’s very fresh and vibrant. JG: Wow. What’s the sugar on this? I mean it’s got fruit but it’s not, ya know, there’s no sweetness really. DS: No, there’s no sweetness. I mean, this is finishing dry. I mean we’re around a gram of sugar, so it’s pretty much as low as we can as we can go. But as you say, there’s plenty of fruit so it doesn’t feel in any way aggressively dry. It’s in balance. JG: I’d have to agree with you there. And what are the actual regulation right now on the production of Ripasso and actually that’s another thing maybe you can touch on just really quickly, you don’t have to touch on it too much, but I see all these other things out there, like, you know, that have twists on the name and it’s somewhat confusing. I mean, for me, and I’m sure it’s confusing for the buying public. DS: Yeah. I think it’s a bit confusing for everybody to be honest with you. Because when you see Ripasso on the label, the wine should be a wine that’s repassed on the pumace or the skins of the of the Amarone. That’s what a Ripasso is. You see a lot of lookalike wines nowadays and wines given fancy names and different names where people are using other methods to try and replicate the flavor profile and the, the body texture, et Cetera for Ripasso. And you know, even though in their own right, some of these wines might be good wines, they’re not Ripasso. And you know, and they can’t replicate it perfectly. So you see a lot of wines where sometimes people will use a portion of dried fruit and add it to their fermentation tank to spark off more and more fermentation, more flavor, et cetera, or they’ll add dried grapes to a finish wine and then put in some yeast to try and bump it up. I mean, these are all wines that may have their own merits, but however they are not Ripasso. The thing about a Ripasso and a very important thing is that it’s got to be a good wine in the first place. You’ve got to have a very good Valpolicella. You put it in with the Amarone and the Amarone skins, they just give it a little bit of polish. They give it an accent. They bring up the texture and the flavor of the wine. JG: That’s what happens on this wine. It’s beautiful. And how much is actually produced. I mean, I heard something about, I don’t know, a certain amount of bottles being produced in accordance to how many bottles of Amarone. DS: …of our Ripasso for our Amarone, which means that we’re not overextending the skins that we’re using. We’re not drying them out too much. JG: That’s not a lot of wine actually. JG: Okay, let’s move on to Amarone. So this is the 2011, uh, Calcarole, is that correct? JG: Well, what’s that stand for? What’s that refer to? DS: Well Calcarole is, it’s calcare. It’s limestone. JG: Oh, that makes sense. DS: Because essentially this is coming from one single vineyard in Negrar in Valpolicella and the terroir is limestone terroir. This essentially, it’s like a limestone rock in Negrar, with a little bit of soil on top and the vines are planted on terraces up the hill. Then there’s this slightly sloping, sweeping plateau on top. So it’s very, very poor soil for growing just about everything else. But it’s obviously fantastic for grapes because you put a vine in bad soil and the grapes really thrive. JG: Yeah. Well let’s give it a go. JG: Ooh, a little bit down the wrong tube there. JG: Wow, that’s amazing. And again, I’m not finding it very, you know, sweet or super duper raisiny or pruny like some humongous Zinfandel or something, which a lot of people sometimes refer to Amarone as like being some giant Zin-like wine, but I’m not really finding that here. This is really just coming up, really elegant. DS: Well, that’s nice to hear that word because that’s a word that we would like to associate with the wine. I mean this is Amarone of course, I mean it’s made from dried grapes, but what you really experienced is a fine wine. It’s a wine where you have, there’s a lot of flavor, a lot of concentration, but there’s no thickness or heaviness. This wine carries a certain fresh profile through it. Even though we’re hitting 16% alcohol, you know, you have all the concentrated flavor that you get from our vineyards, from drying the grapes, from three years in oak. But as you say, it’s not particularly raisiny. We don’t over dry our grapes. We believe that we are bringing in grapes that are in such a condition in the first place that are suitable for a good wine that we don’t need to have a prolonged drying period. We will dry for three, three and a half months, and then we begin with the wine. JG: Wow. This is delicious. JG: So, we should have talked about this before, but as far as like fruit, I mean, are, you know, are there sources around the Veneto or around obviously Valpolicella, that Rizzardi are sourcing from or is it all estate? DS: Oh, no, it’s all estate. For our Amarone it’s coming directly from our own vineyards. Everything’s done in house and it’s very much, you know, it’s quite a painstaking process. It’s labor intensive, but we get the results we get from it. I mean everything is picked by hand. It goes into boxes in the vineyard, then they’re brought to our fruttai or drying room, which was purpose built in the 18th century with windows open north and south to let the breeze come through. Um, we have no control over our temperature or humidity. We have mechanical fans that have been used for, for years and years and years to keep the air circulating. But as I say, we, we don’t control temperature, we don’t control humidity. So it’s quite a, you know, it’s quite a craft way of doing Amarone. It’s the old way of doing it, but we get the wine we get. JG: So you’re talking about like, you know, the environment outside and you know, the hills being able to interact with the grapes and they’re not like just stuck in a big giant, refrigerated warehouse or something. DS: No, no, it’s not. JG: Oh, that’s good. You were saying like the old, the old fashioned way…are there old vintages available at the winery? DS: Yeah, there is. We keep back a certain amount every year. We started doing that a number of years ago. We always kept a small quantity and we’ve increased that a little bit, so you know, in the future we’ll be able to release the odd vertical case or pop in to the market a few cases of an old vintage. So we like to show our Amarone when it’s aged. It’s quite interesting for people to come and taste at the winery or in the future when we do wine dinners, et Cetera, when they see a Amarone with age, it really changes people’s perception of Amarone because it really ages and matures like, like a great fine wine of the world and it can actually become difficult a bit later on to identify exactly what it is because it becomes a very complex wine. JG: Okay. So how old are we talking about at the cellar. Are talking about 1900 or before? DS: Yeah. Ripasso is a wine they used to put on the pomace of the skins off Recioto della Valpolicella, which is the sweet red of the region. So Amarone only really came about by accident in the 30s, and then started to sort of see production in the 40s onwards. So we don’t keep vintages that are that old. We have some very, very old vintages, but they’re private. They belong to the family. And then for us, in terms of the business and tasting and journalists, et Cetera, we kind of go back to 1988 with our Amarone. So we have a pretty clear run from 88 up to now. JG: That’s pretty good. Do you have a whole bunch in your cellar? DS: Uh, no. They never last long. That’s the problem because when I’m in Italy, people want to come and visit and a lot of my friends are wine friends, so they usually destroy it. JG: Exactly. And then you have to go back to the office and get more wine. JG: Uh, tough. So what can you tell me about any trend or. I don’t know, movements going on right now in the Veneto? In Bardolino? JG: I look forward to it. And you were saying it’s more suitable to your climate. Last night you mentioned something about like, you know, climate change is really having an effect on the area and the producers and the vines and everything, you know, elaborate? DS: Yeah. Well let’s say without getting into too much controversy, there’s no doubt that in our, in our European vineyards we are seeing warmer and warmer seasons. I mean that’s really noticeable for example, for German wine producers that record the data very, very accurately and over the years they’ve seen their gradual summer temperatures rise and rise and rise. Uh, we face the same sort of thing where things are getting a little bit warmer. And for example, in the Soave we have to know in these warmer years, we’re having to pick some of the fruit a little bit earlier to retain freshness. So yeah, it’s something that affects our choices. JG: Ah, I think it’s happening everywhere. You know, earlier harvest, bigger wines, people moving north, ya know. JG: So that sounds good. Um, let’s try to wrap this up, I guess, and we’ll get out of here and go get a beer. Actually speaking of beer, what kind of beer do you drink, actually? DS: Well, when I’m back home in Ireland it’s Guinness, but when I’m on the road I actually like something, which is not too wacky in flavor, ya know. I like something that actually tastes like a beer. JG: What, you don’t want a full-blow triple hopped IPA that tastes like, ya know, orange juice? DS: Yeah, no. I’ll pass on that. I like an IPA, but not over the top. JG: Well, let’s get out of here and go get a beer. JG: Alright. Thanks again and, uh, let’s do it.